ABSTRACT: This paper discusses the crafting strategies Japanese haikuist Ban’ya Natsuishi uses to create emotional depth in three haiku collections: Endless Helix (2009), Hybrid Paradise (2010), and Black Card (2013), published by Cyberwit Press. Natsuishi is a professor at Meiji University, Director of the World Haiku Association, president of Ginyu Press, and Director of Tokyo Poetry Festival. His three emotionally evocative volumes of haiku present a variety of themes, including natural and nuclear disasters, which have in recent years devastated Japan. To serious haikuists, Ban’ya Natsuishi may be a familiar name. Natsuishi is a professor at Meiji University, director of the World Haiku Association, president of Ginyu Press, and director of the Tokyo Poetry Festival. Haikuists who’ve submitted poems to the poet/publisher/editor may recall the affectionate “Love ya” with which Natsuishi concludes his professional correspondences. And those who’ve examined Natsuishi’s creative works may have noted distinctive features in his haiku (and/or senryu). His subject matter includes particularly dark and somber themes, such as natural and nuclear disaster, which lends emotional depth to his poetry. This emotional depth is a key element in Natsuishi’s distinctive style, evident through an exploration of three of his haiku collections, published by Cyberwit Press: Endless Helix, Hybrid Paradise, and Black Card. In these collections, the reader will note a remarkable range of emotions from the human experience, from lighter to darker moments, though darker moments, with the inherent sentiments they invoke, are more often featured. The idea of death and disaster can make some feel uncomfortable, threatened, but such themes and their emotional impact are important to explore since they genuinely reflect the human experience. Endless Helix (2009), Hybrid Paradise (2010), and Black Card (2013) present haiku evoking a wide range of emotions and involving a wide range of crafting strategies that furbish the depth of emotion. From grief and horror to hope and joy, the selections reflect the human condition in their intensity of feeling. It is worth noting, however, that most of Natsuishi’s selections from the three volumes evoke decidedly negative emotions, due largely to the subject matter they concern, such as the Fukushima nuclear accident, precipitated by a massive earthquake and tsunami, as well as the historic atomic bombings of Hiroshima and Nagasaki that ended World War II. The poet is somewhat unique in his decision to embrace such lugubrious themes in a poetic form often associated with serenity and natural beauty. Stylistically, poems of this variety harken back to Japan’s artistic tradition, with painters such as Kawanabe Kyosai (see Figure 1), whose works feature ghosts and demons, depicting human fears difficult to express with words, fears of death and the supernatural unknown. The poet may be sharing with the reader about the difficulties of his childhood: a father who sometimes drank to excess and the unfading memories of the fearful emotions it produced. Of course, the poem may also be read as analogous, speaking directly of a tsunami’s menacing threat. Uncertainty is another emotion aroused in Natsuishi’s haiku. Here, color symbolizes negative and positive outcomes. What does our future hold? Good or bad? Gold or black? The anxiety caused by these uncertainties is successfully suggested through figurative language. Below is another selection evoking a feeling of uncertainty. This selection’s import is highly open-ended. Many different possibilities for interpretation are inherent through association. Might the poet speak of the possibility of dementia in old age? Or does he call to mind our human inability, or belligerent refusal, to learn from the mistakes of our past? Either way, the feeling of uncertainty comes across through diction and imagery. Tying in with uncertainty, insecurity is a feeling repeatedly evoked in, especially, the disaster-themed haiku of Natsuishi. One may note the sense of insecurity, or futility, captured in the below selection, both deeply ironic and facetious. Here, we get the sense that all our plans, symbolized by the roses, will be lost by upheavals beyond our control. Natsuishi conveys the idea of tragedy subtly through natural imagery. He emphasizes the concrete image of the roses by assigning them a line of their own. This selection is another example of significant line breaks in Natsuishi’s haiku. A complete divide exists between the natural world in line two and urban holocaust in line three. The poet continues the naturalistic tradition in haiku, using natural images to convey human emotion, linking human experience with nature. The same strategy can be noted in the below selection, expressing the feeling of dehumanization, but another variety of insecurity. Ironically, the “forest” is the asphalt jungle, where men are comparable to dogs. Natsuishi suggests a regression to our primordial past, a tragic return to primitive, animalistic existence. The same idea is hinted at in another selection. This selection evokes a clear feeling of confinement. Startling colors heighten the emotion inherent in the imagery. A sense of being confined or constricted emerges in other selections as well, as multiple haiku converge thematically to enhance the emotional impact of each other. Here, existence following disaster is like living in a tiny box. We are caged like trapped animals; all we do and say is restricted to a tiny space, bounded on every side by impenetrable walls. Line two may hint with more particularity at the nature of the disaster: a raging sea (tsunami). Natsuishi clarifies the experience through the haiku crafting technique of association (Reichhold). The poet depicts the apocalyptic experience with depth. Continuing with the concept of disaster-forged dehumanization, the poet uses irony and imagery to describe a famished human being, inching toward the comfort of a bowl of dog food. The image is startling, presenting one vivid example of the terrible impact of natural and/or nuclear disaster. The poet uses metaphor to convey the impact of apocalyptic experience. Once more, humankind, grappling with natural and/or nuclear disaster, is dehumanized into the tiniest of animals, striving beneath impossible burdens. The poet speaks of that unhappy moment we might experience when we find we’ve lost something precious, and we don’t understand how it happened. The golden grass metaphorically presents that precious thing. The snake, harkening back to Christian archetype and myth, is that ambiguous evil that thwarts us. True, haiku often deals with naturalistic themes so that deforestation itself would amount to a woe worth lamenting. Yet an additional metaphorical level is possible. The tree may represent any element worth preserving that becomes lost through destructive forces. Here, Natsuishi uses the rhetorical device of question-asking to prompt our thinking about an important topic with intrinsic emotional impact. The beauty of the locale before the bombing is captured in the natural symbolism of the butterfly. Personification and animation are other literary devices Natsuishi relies upon when presenting themes of grief and horror. Here, nuclear disaster is demonized, while human grief is projected onto nature, deepening the emotion. Here, focusing on a single blade of grass, the poet employs the haiku crafting technique of “thinking small” and “looking closely” as an approach to depicting one scene or “aha moment” (Janeczko 52). Also, by employing ironic word choices such as “richly baptized,” which normally have positive connotations, to portray nuclear contamination, the poet enhances the emotional impact of the poem. He makes light of the situation, almost satirically. This is also a poetic technique understood to evoke emotion (Hambrick 1). Natsuishi employs the same strategy of ironic diction in additional selections. The poet uses unexpected and fresh word choices such as “festival” to describe the horror. Irony, “when the unexpected happens, or is said,” is another poetic technique known to evoke emotion (Hambrick 1). In other instances, the poet astonishes the reader to enhance the emotional impact. The reader is presented with one layer of the grotesque on top of another, as the poet continues to “look closely” and “think small.” He reverses the pattern of shorter line/longer line/shorter line perhaps to emphasize how the disaster has turned the world upside down, which, in turn, emphasizes the horror. This stylistic feature can be noted in other selections by Natsuishi as well. The poet employs exemplification and specificity to deepen the sentiment. Natsuishi uses the rhetorical strategy of comparison and contrast to liken the disaster’s devastation to the feeling of being unloved. This technique of comparison is intrinsic to haiku. As noted by Betty Drevniok: “In haiku the SOMETHING and the SOMETHING ELSE are set down together in clearly stated images. Together they complete and fulfill each other as ONE PARTICULAR EVENT” (Reichhold). 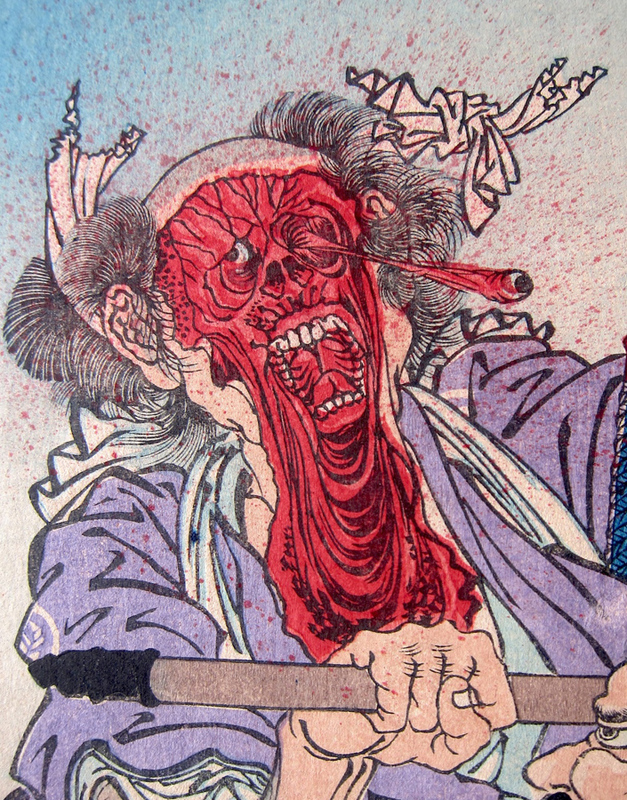 With vivid imagery and synesthesia, the perception that one physical stimulus is another (Trumbull 101), Natsuishi depicts the grievous tragedy of death. Some of the deepest feelings Natsuishi evokes involve a horror over death not specifically tied to any event. The poet uses crafting strategies to incite feelings of grief over the loss of a loved one. A personal pronoun, “his,” describes a skull that was once a living being, affectionately held. Compounding and deepening the emotion is the snake; that archetypical, evil enemy of man; who’s taken over and now possesses all that’s left of the deceased person. 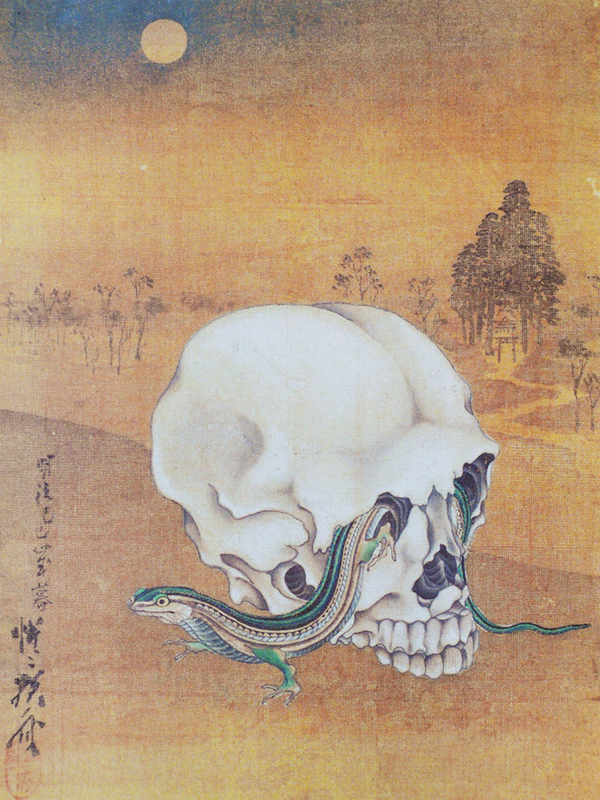 The living snake writhing in the skull is more horrible than an empty skull alone! This is another selection that may harken back to Japan’s artistic tradition, with painters such as Kawanabe Kyosai (see Figure 2). Of the three volumes in focus, Black Card (2013) may be Natsuishi’s darkest collection, published in the years following the Fukishima nuclear disaster. Compared to his other volumes, Black Card centers most definitively on urban upheaval after catastrophic events. Black Card employs a variety of poetic strategies to depict with emotional depth, a climate of physical and metaphysical desolation after cataclysm, along with the resultant emotions of grief and horror. In this selection, we find the simple theme of love and family. The child reflects the promise of life’s continuity, symbolized by a fruit bearing tree in full bloom, connected to the child. The poem is uplifting, evoking joy. The speaker expresses hope and joy, finding within himself something with which to carry on. That life also affords these instances is overtly expressed in another selection as well. Here, the poet expresses that moment in which happiness bubbles up within him for no particular reason. It is a shared human experience the reader can relate to. Here, the hopeful idea of life after death is introduced metaphorically. The singing bird is like our soul, finding paradise “behind the mountains.” Again, the poet uses crafting techniques to generate the feeling as metaphor is always a device useful toward that end (Ross). Here, the speaker projects unfulfilled human desire onto the bird. The poem concerns unutterable human longing referenced metaphorically as the “black stone / in the bosom of the moon.” The moon is personified, reflecting the human wish for intimacy. Overall, in Endless Helix, Hybrid Paradise, and Black Card, Natsuishi showcases, among other themes, Japan’s historical and more recent natural and nuclear disasters. In these volumes the events seem to take on dimensions beyond the physical or natural. A supernatural, metaphysical aspect is embedded in the tragedies, leaving the poet grappling on multiple levels. Using a variety of crafting strategies to foster depth of emotion, Natsuishi gives those lucky enough to not have personally witnessed the apocalyptic events a chance to understand and learn from them. Natsuishi achieves depth of emotion, and a variety of emotions, by employing diverse poetic techniques. “Meaningful poems invite or evoke an emotional response” (Hambrick 1). With their depth of emotion, Natsuishi’s haiku achieve a level of meaningfulness. Gurga, Lee. “New Zealand Poetry Society Te Hunga Tito Ruri O Aotearoa.” Toward an Aesthetic for English-Language Haiku by Lee Gurga. Web. 30 Sept. 2015. Hambrick, Willow. “The Poem as Craft: Poetic Elements.” Web. Janeczko, Paul. How to Write Haiku and Other Short Poems. New York: Scholastic, 2004. Print. 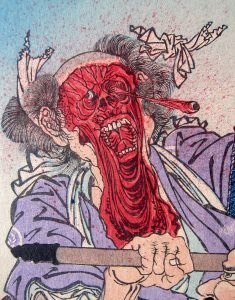 Kyosai, Kawanabe, Figure 1. 2 Oct. 2015. Kysoai, Kawanabe, Figure 2. 2 Oct. 2015. Natsuishi, Ban’ya. Endless Helix. 2nd. ed. Allahabad: Cyberwit.net, 2009. Print. Natsuishi, Ban’ya. Hybrid Paradise. Allahabad: Cyberwit.net, 2010. Print. Natsuishi, Ban’ya. Black Card. Allahabad: Cyberwit.net, 2013. Print. Reichhold, Jane. “Haiku Techniques.” Frogpond (Autumn 2000). Web. 1 Oct. 2015. Ross, Bruce. “The Essence of Haiku.” Modern Haiku 38.3 (2007). Web. 1 Oct. 2015. Trumbull, Charles. “Meaning in Haiku.” Frogpond 35.3 (2012): 92-118. Print.